Hi there!! I made a cute little easel card to share with you today using my Cheeky Cherry Greeting Farm stamp and Jaded Blossom stamps! Love it! So cute and great coloring! 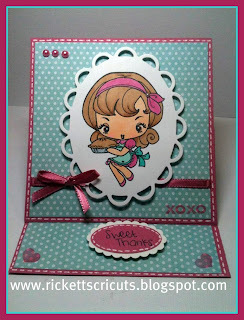 I love the Cheeky line from The Greeting Farm and, of course, I have all the Jaded Blossom stamps from the latest release, so I just may have to copy you! I love this!!! The colors are adorable! !